Welcome Service Offerings Schedule and Pricing Location and Contact About Pricey, right? Meet Leala; Clinical and Sports Massage Therapist. For fascinating reasons she’ll tell you herself, massage therapy has been a huge part of Leala’s destiny from a very young age. The therapy she gives comes from deep within her intuition, but combines modern, clinical techniques that result in tangible results. Leala has the extremely rare ability to instinctively find a disruption in the body and take the best approach to smooth it out. Her touch is warm and soothing, yet precise and intentional. Leala’s sessions leave you feeling deeply relaxed but strategically combed out. She specializes in Clinical Deep Tissue and Sports Massage. Leala specializes in nourishing, full body sessions as well as focused, more clinical sessions for specific areas. 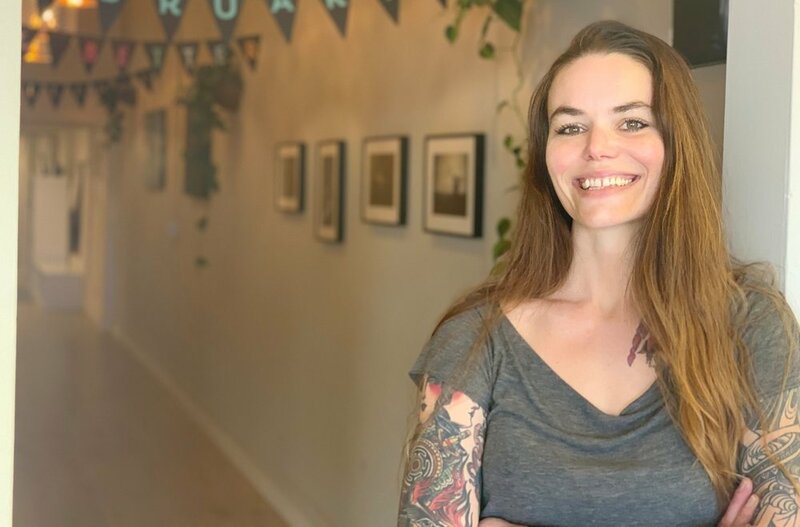 Hello, I'm Maggie, the owner of Oakland Body Therapy. I'm a certified Massage Practitioner, Fascial Stretch Therapist, barre fitness, stretch and foam rolling instructor. I focus on bringing mobility and ease of movement to my clients by any means necessary, and I enjoy empowering people to take charge of their bodies and learn to heal their pain. My bodywork practice in nestled here in Oakland, California, but I reach a larger audience by co-owning the business it's nestled in, Remedy Barre and Foam Rolling. I've been practicing massage therapy since 2005 and I'm grateful to be in a field that offers such broad opportunity for change, growth and improvement. I was 3 when my mom put me in ballet class for the first time. I pretty much kicked and screamed about it my entire childhood, but she wouldn’t let me quit because she swore (and still swears, like any good mom) that I was the best one there. Now that I’m removed from that life, I can objectively say that I think most of the time she was right. It wasn’t because I was blessed with a long, graceful body; in fact, I was kind of the opposite. I was short, and I had a thickness to me. Looking back on those times, I realize now that I was a good ballet dancer because I felt my body in a way I couldn’t explain. When I extended my arms out to my sides they never just hung there…they constantly lengthened and subtly unfurled from my scapulae all the way down to the tip of my fingers. When I lifted my leg it didn’t just lift and stop, it grew. From my core at the bottom of my ribs, into my hip girdle, spiraling down my leg and all the way down to my reaching, pointed toes. Extreme energy beamed out entire leg only to finally hit the wall at the other end of the room. I could feel everything. Every, tiny detail. These are my 19-year-old feet! When I was 16 I became a bit more socially interested and stopped feeling my ballet as much. I got a little more lazy in class, didn’t try as hard and wanted to be other places. My body became a little “dumber,” I guess you could say. I wasn’t as in-tune anymore, and I didn’t really care. I started to develop this pain in my hip. When I did any kind of extreme leg kicks or lifts my hip would pop and it was really aggravating. The pain started to kind of always be there and I couldn’t get comfortable anymore. I went to see a physical therapist, she gave me some stretches to do that didn’t make sense to me, and said maybe I could cut down on the dancing for now. So I decided to stop and be a teenager. A couple years later, I moved away and began taking ballet classes again, which I’d continue until the age of 27. One thing in my life led to another (a story for maybe a different time) and I realized, without ever having gotten a massage or having any experience with bodywork, that massage therapy was 100% my calling. It was like a lightbulb had just exploded in my head and there was nothing else I wanted to do. It made sense…I was never great academically but I spent my entire life studying my own body, so why wouldn’t I be able to relate what I already intrinsically knew to other people? When I was a young ballet dancer, my muscles were so strong and healthy as long as I utilized them well. When I stopped caring about ballet, I started using my muscles improperly and they failed me. I was straining them upon leg lifts and so forth instead of using my intelligence to use them correctly. That pain I had experienced all those years ago as a young dancer was nothing more than a psoas strain, that could have easily been released and worked on in a span of no more than 10 minutes. Ever since my lightbulbs, I’ve been helping people realize the potential of their bodies' capabilities and disarm the mystery and fear we have around our aches and pains. In many cases your body is just asking you to pay attention, not to shut off. I teach at and co-own Remedy Barre and Foam Rolling, do one-on-one coaching for self-pain relief and practice bodywork part time now. And, although I no longer dance, I still feel my ballet every day. I guess I have my mom to thank for that. While Maggie is on leave, please contact Leala via email.